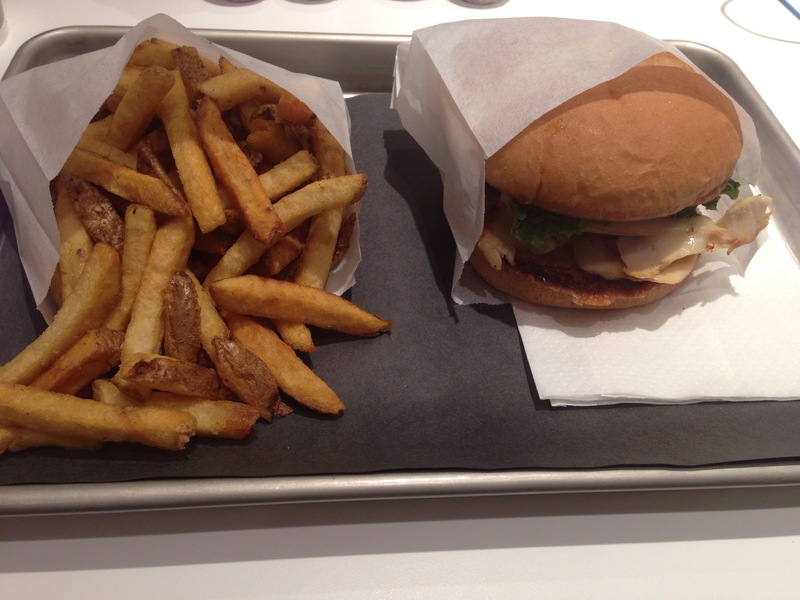 One thing I like about Krave’s burgers is how clean-cut and simple they look, and this burger was no exception. The burger was packed full of slow-roasted chicken, and the basil mayo and vinaigrette were already dripping out the sides. My one concern, which tends to always be the case when I first see my burger here, is that it’s not quite going to be enough to satisfy my hunger. Although, usually I am proved wrong before my tray is even empty. The chicken in this burger was great! It wasn’t at all dry, and it had some really tasty flavours. I’m the kind of guy that likes a good amount of sauce on his burgers and this one did not disappoint. There was a generous amount of the balsamic vinaigrette, and even though it did make the burger slightly messy, it was worth it. I also enjoyed the basil mayo as it was the perfect companion for the chicken. If you have read my other posts for Krave, you know that I love the buns they use. The simple task of buttering and toasting the bun gives it both a great texture and taste. For this burger, it will cost you $7.99, plus $3.49 if you want to make it a combo, which I’d recommend doing. Getting this burger, with fries and a drink, for around $12 is a great deal. The quality of both the service and the food really shows at Krave, so you can’t complain about the cost. Krave continues to impress me with their burgers. They do their beef burgers right, and if I had to choose, I would probably take one of those over this burger. That being said, this burger was a good time, and it is a very solid choice for any visitors that may want a non-red meat option to choose. I’m already looking forward to my next visit to Krave, so that should tell you something!